Avista is the largest provider of outdoor movie rentals and inflatable movie screens in California. We are the largest (and best!) based on having professional grade gear, extensive customer support, and fantastic prices. 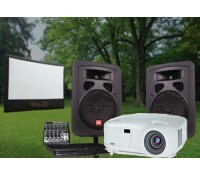 An Outdoor Movie System Rental from Avista is a unique and fun way to enjoy California living, whether you live in Calabasas, Torrance, Santa Rosa, San Jose, or all point in between! 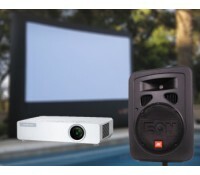 Avista makes it easy to do an outdoor movie, for consumer, neighborhoods, schools, parks departments, and municipalities. Call us with any questions and to book your rental now! 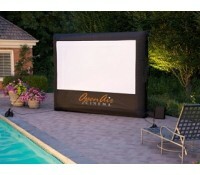 Our do-it-yourself systems feature 9' inflatable screens, ideal for most backyards and up to 50 people. Just supply the power, a movie (DVD or laptop) and the popcorn. You can plan to start your movie at dusk, which ranges from 8 to 8:45pm during the summer. Featuring screens either 12', 16' (as shown, for South San Francisco Parks Department on June 16, 2017) or 20' across, these large scale rentals handle audiences up to 750. 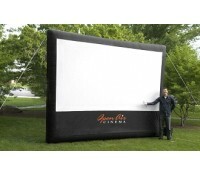 Perfect for school fundraisers and Movies in the Park summer programs. Full service operation by Avista technicians. We have perfectly-paired inflatable screens with projectors and sound systems, so you can be assured that everything works together in one, easy-to-use package. Do-it-yourself to save money, everything fits easily in almost any size car. 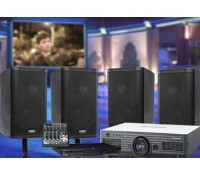 If you are picking up your outdoor movie rental from one of offices, we give you easy step-by-step instructions. And if you forget something right before the movie starts, rest assured that Avista technical support is a phone call away, 24/7. Outdoor Movie Rentals Customers love us on YELP! (Los Angeles, CA) rented one of their packages for a 75 person, indoor movie screening. The total was just above $200 with taxes. Since I opted to pick up the equipment over having it delivered, I saved a few hundred dollars. When I arrived I met a young lady, who showed me step by step how to assemble and disassemble the equipment. She was extremely friendly and knowledgeable about the set up. She even helped me take the equipment to my car! I returned the equipment Monday and she again helped me carry items in! This entire experience was easy and painless. (Lafayette, CA) These guys are great. We rented the small outdoor movie package for our daughters 14th birthday party. Great equipment, great value. Had a small snafu on pick up and delivery, but they stepped up and handled things professionally. Clayton at the home office was great in getting us taken care of. Great for 250-500 people, incl. a 16' x 9' screen, 4000+ Watts of sound, a 6000+ Lumen projector and full delivery & setup. 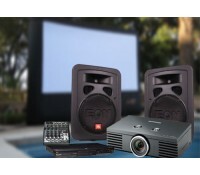 A great outdoor movie package for up to 50 viewers, incl. a 9' x 5' screen, 2 speakers & eye-popping high definition.